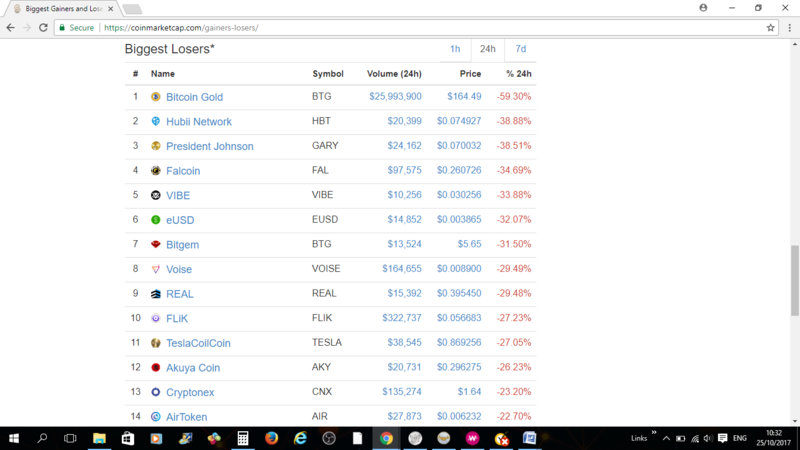 The first day of bitcoin gold in market cap 25.10.2017. It appears that in its first day of existence bitcoin gold has lost a lot and I believe this is not surprising as there are lots of points that are not still clear. But I don't think anyone would have imagined 59% of lost in its first day but yet this shows that still there are lots of investors that are not trusting it. But lets wait and see what happens as these type of results could help the developers to react and think again and resolve the problems if they want the coin to last in the market. Still there are many exchanges and hardware wallets have not relist the new coin and I believe the official date is on 1st of November.